CATSKILL, NY - November 7, 2017. Longtime industry executive Sally Dedecker died peacefully Monday evening, after a bout with cancer. She was 62. Known most recently as Book Expo’s Director of Education, she ran her own consulting company Sally Dedecker Enterprises since 1993. Prior to this she was Vice-President of Marketing at Ingram Book Group, Vice-President of Sales at Simon & Schuster, and Trade Sales Manager at NAL. 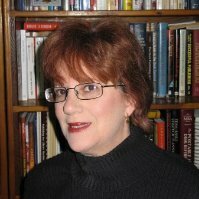 A graduate of Hofstra University on Long Island, New York, Sally Dedecker began her publishing career right out of college as an assistant to the head of ACE Books, Tom Doherty, and worked her way up to sales management there. In September, Sally Dedecker was honored at the Book Industry Study Group (BISG) Annual Meeting with a Lifetime Service Award in recognition of her “tireless and persistent efforts” as a board member for 22 years. “Sally was a mentor, champion and friend to many in the book industry. She was one of the people who wore many hats and anchored the industry in uncountable ways,” said Seth Gershel, an independent publishing consultant who knew Sally Dedecker since her early days in the publishing industry when she was at ACE books and who also worked with her recently on Book Expo educational programming. She is survived by a brother, George Dedecker. Plans, including those for a memorial service, will be shared at a later time. The family asks that donations be made to the Lung Cancer Alliance. Color photo from LinkedIn, photographer unknown. B&W photo by Susannah Greenberg. Capture of video still from BookTV and C-SPAN, 1999. Sally Dedecker presiding at a panel at Bookexpo in 1999, via BookTV and C-SPAN. Very sad news: Sally Dedecker, who worked in sales and marketing for several publishers, ran her own consulting company and was head of education for BookExpo, died on Monday. She was 62 and had lung cancer. For more than 20 years, Sally was also a board member of the Book Industry Study Group, which in September gave her a Lifetime Service Award. In presenting the award, former BISG chair Dominique Raccah of Sourcebooks said, "As we continue to reinvent BISG, there's no better example of what our core values mean in practice than Sally Dedecker. For more than half of the time that BISG has been serving the industry, Sally has been serving BISG." For many years, she was president of Sally Dedecker Enterprises, a publishing consulting firm that she founded in 1993. In 2011, she was named director of education for BookExpo. She had earlier been v-p of marketing at Ingram, v-p of sales and distribution services at Simon & Schuster, and trade sales manager at New American Library. We remember Sally as sharp, quick-thinking and with a great sense of humor. We'll miss her. Longtime industry executive Sally Dedecker died peacefully Monday evening after losing her long-fought battle with cancer. She ran her own consulting company, Sally Dedecker Enterprises, since 1993, and was honored at the recent Book Industry Study Group (BISG) annual meeting with a Lifetime Service Award in recognition of her 'tireless and persistent efforts' as a board member for 22 years. Since 2011 Dedecker also served as Book Expo's Director of Education. She began her publishing career as an assistant to the head of ACE Books, Tom Doherty, and served as an executive at Ingram Book Group, Simon & Schuster, and NAL. An obituary remembers her as "a mentor, champion and friend to many in the book industry." Plans, including those for a memorial service, will be shared at a later time. Sally Dedecker, a longtime figure in the book industry, died from cancer at age 62 on Monday, November 6. She is survived by her brother, George Dedecker. Dedecker recently worked as BookExpo’s director of education and ran her own consulting company, Sally Dedecker Enterprises. She previously served as vice president of marketing for Ingram Book Group, vice president of sales for Simon & Schuster, and trade sales manager for NAL. A graduate of Hofstra University, Dedecker began her publishing career as an assistant to the head of ACE Books. The family has asked that donations be made to the Lung Cancer Alliance. CATSKILL, NY - November 7, 2017. Longtime local Catskill resident Sally Dedecker died peacefully Monday evening, after a bout with cancer. She was 62. Known most recently as Book Expo’s Director of Education, she ran her own consulting company Sally Dedecker Enterprises since 1993. Prior to this she was Vice-President of Marketing at Ingram Book Group, Vice-President of Sales at Simon & Schuster, and Trade Sales Manager at NAL. A graduate of MacArthur High School in Levittown NY and Hofstra University. New York, Sally Dedecker began her publishing career right out of college as an assistant to the head of ACE Books, and worked her way up to sales management there. She was predeceased by her partner Mike Reed and is survived by a brother, George Dedecker and his wife Pamela. Family and friends will gather on Thursday, Nov. 16th from 3:00 - 6:00 p.m. at Millspaugh Camerato Funeral Home, 139 Jefferson Hgts., Catskill. A prayer service will be conducted by Sister Mary Mazza at 4:30 p.m.